Keith has used DxO Optics Pro for quite some time. One reason in particular has been its handling of image geometry adjustments and corrections. 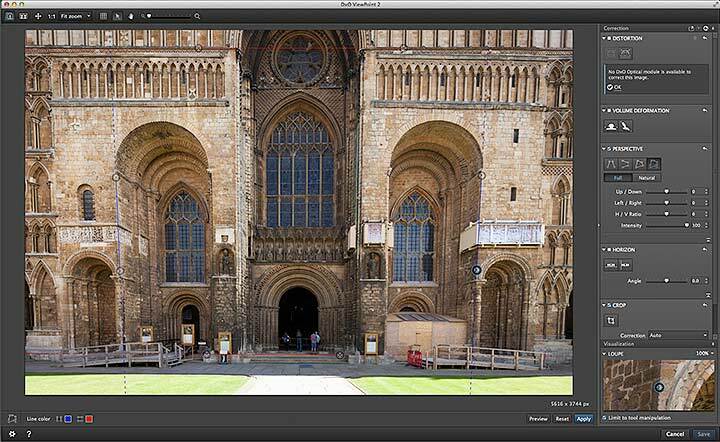 A while ago Keith Looked at ViewPoint V1.1 from DxO, which offered some of these adjustments in both standalone and plugin form. 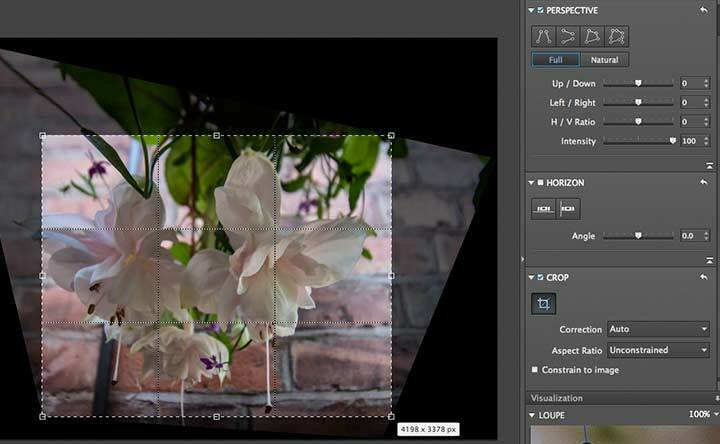 ViewPoint 2.1 expands on the utility of the package, and includes various refinements and improvements. 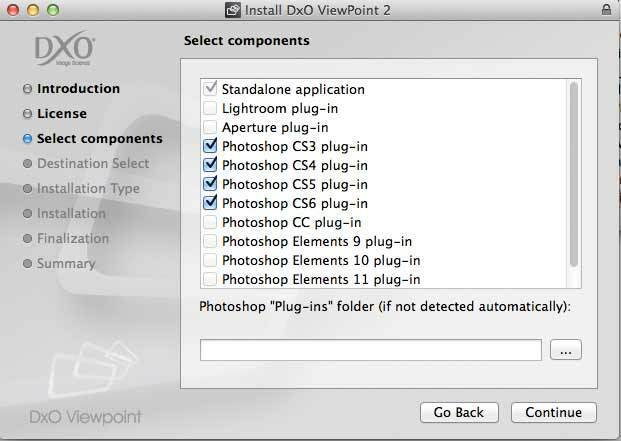 This review update is not a comprehensive look at all of ViewPoint’s functionality – there are some excellent examples and tutorials on the DxO web site. 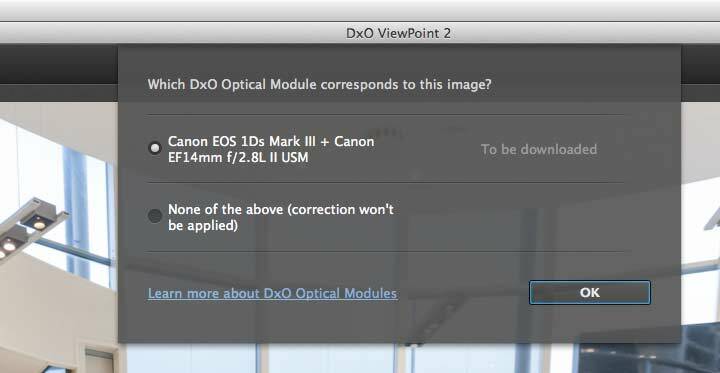 There are more examples of the kinds of correction available in Keith’s original ViewPoint 1.1 review and his review of DxO Optics Pro 9.1, which includes much of the ViewPoint functionality. All Keith's DxO reviews may be found via the Article Categories listing for DxO in the right column of any page. One of the attractions for me, with using wide angle lenses, is the control over perspective and composition they can offer. This comes at a price though, since objects towards the edges can appear distorted, and you need to pay a lot more attention to composition to get shots that work. 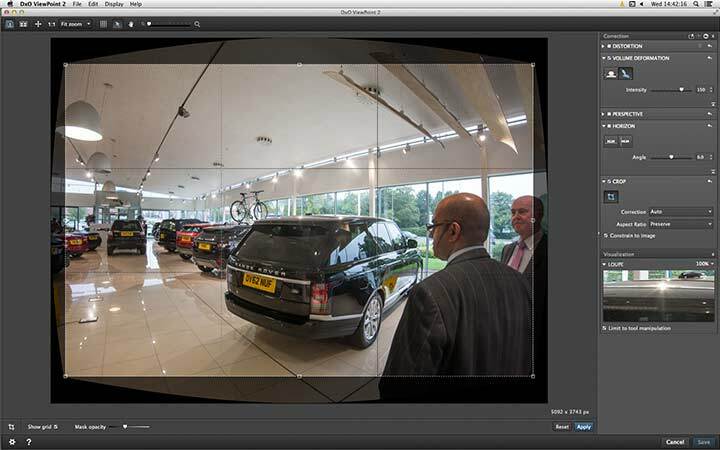 On my Canon 1Ds3 I regularly use the TS-E17mm, EF14mm and EF8-15 fish-eye, so having an idea of what can be ‘fixed’ or altered afterwards is a big help. 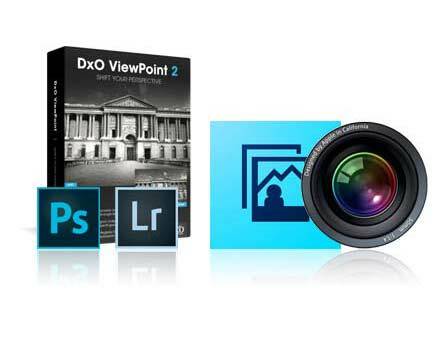 ViewPoint 2.1 – What do you get? 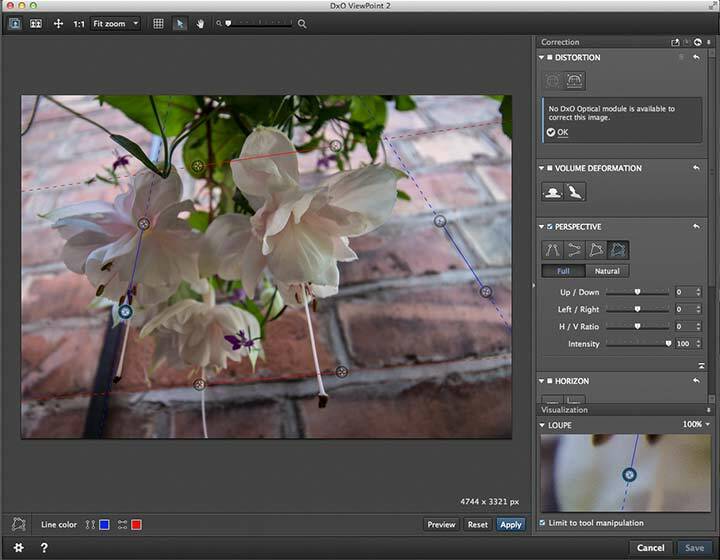 The software works as a standalone package or as a plugin for common imaging programs. During installation, the installer will look around to see what software you have on your system that it can work with. It’s automatically picked four items on my test system. I’m using CS6 a Mac, but functiionality is pretty much identical on a PC. 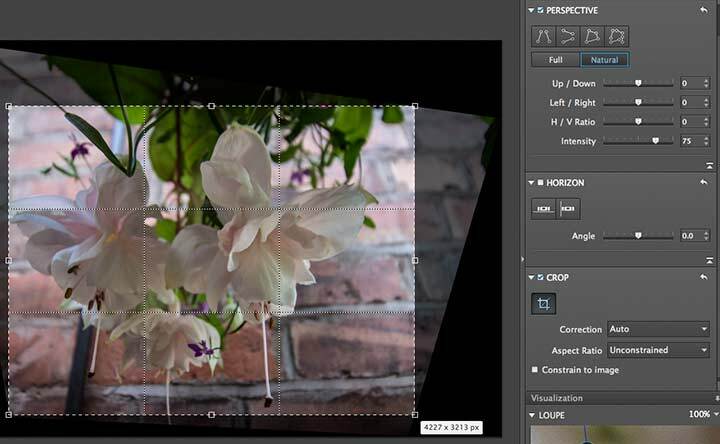 The image that you’re working on opens in a new editing window, with the main adjustment options down the right hand side. The top distortion adjustment will require an appropriate lens/camera module to work directly. One can be downloaded if it is available. This particular image was corrected when I opened up the RAW file in ACR in Photoshop – note that you don’t need a correction module for your image to be processed. Here’s one for an image I’ll be looking at later. ViewPoint 2 offers some nifty adjustments, but I’ll just concentrate on two – correcting verticals/horizontals and the problems with people in wide views. When you tilt a lens upwards verticals converge, so buildings look as if they are leaning back for example. Take this rather slapdash shot of the front of Lincoln Cathedral – none of the verticals are true. Look carefully though and you can see some red and blue lines that I’ve added, marking out some horizontal and vertical lines. 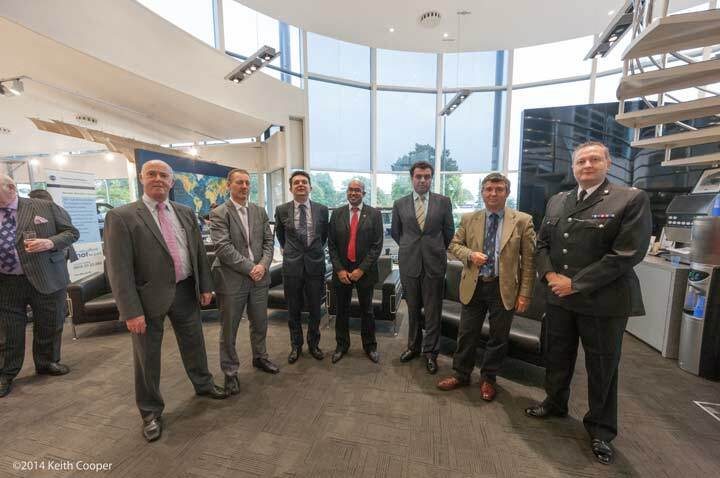 Move your mouse over the image to see the effect of applying the correction. Note though, those black wedges at the side – such corrections come at the price of reducing your effective field of view (unless you like trapezoidal photos). In this more extreme example, I’ve aligned the guides with brickwork. The corrected version below shows quite an extreme change. Just how much, is shown by turning off the auto-crop feature. There is a full/natural setting for this adjustment, which turns down the intensity of the change – move your mouse over the less corrected version (‘correct’ geometry much like ‘correct’ colour often isn’t the best version of an image). 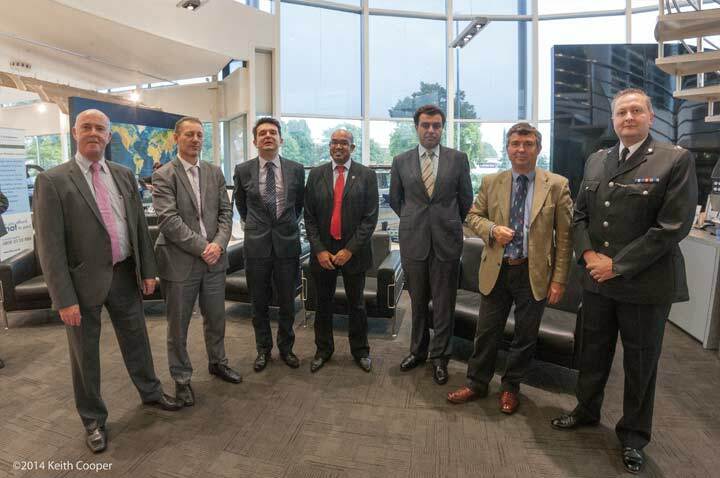 Look at the shot of assorted worthies at a business meeting. 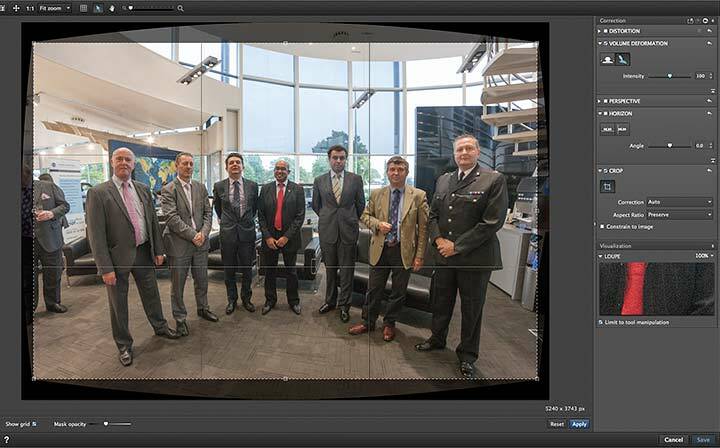 Apart from showing the inadvisability of buttoning up your jacket, unless it fits very well, it shows why many people will shy away from using an ultra-wide lens (EF14mm on a full frame 1Ds3) with groups of people. Move your mouse over the image to see a corrected and cropped version from ViewPoint 2. The screenshot below shows how the image has distortion applied, to make it look better. This is the stronger of the anamorphism adjustments. Applied to the image below, it chops one of the people (mouse over the image to see). The simpler horizontal compression keeps both heads and the light fitting (mouse over to see). Note that the compression does result in cropping of the image (this can be turned off if you don’t need a particular aspect ratio). 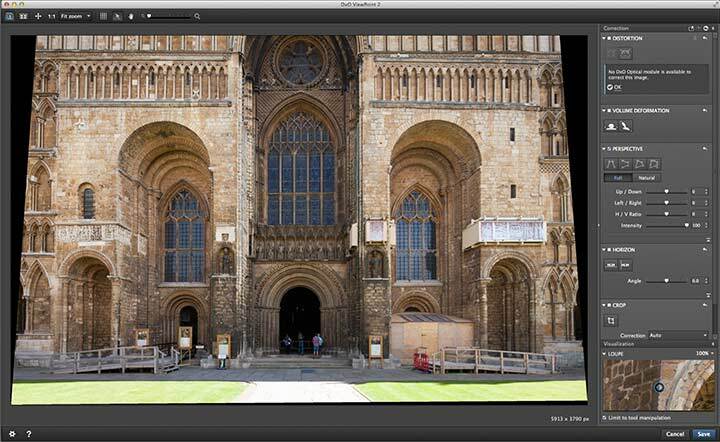 Both types of adjustment can be fine tuned to see which works best for the image you have. It can take a bit of practice to find out what works best for different images, and it’s always possible that it won’t work, or that you lose too much in the crop. That’s why I also work with fish-eye and tilt/shift lenses. See ‘Why I use shift lenses’ – if you’re curious about why? 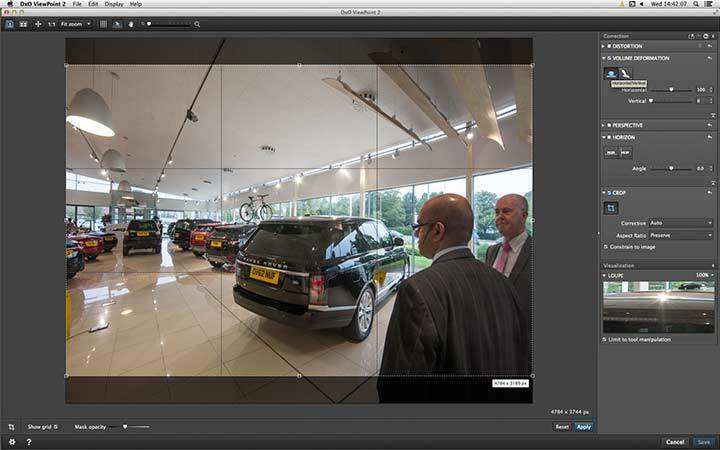 The latest version of ViewPoint doesn’t introduce any drastic changes to what it allows you to do with images. It’s more about getting easier to use and offering different ways of exploring what you can do. It works quickly and efficiently, and the new version gave me fewer points where I’d wonder where to go next. Good software (IMHO) does not try and do everything, just a useful set of things well. I’ve got lots of ways of adjusting and fixing images, but the most useful function of ViewPoint for me is still the way I can use it to include people in my wide angle shots. I don’t do wedding or portrait work, but I do often have people working in shots at the workplace. Being able to combine the human element more freely with some of my engineering and industrial pictures is very helpful. 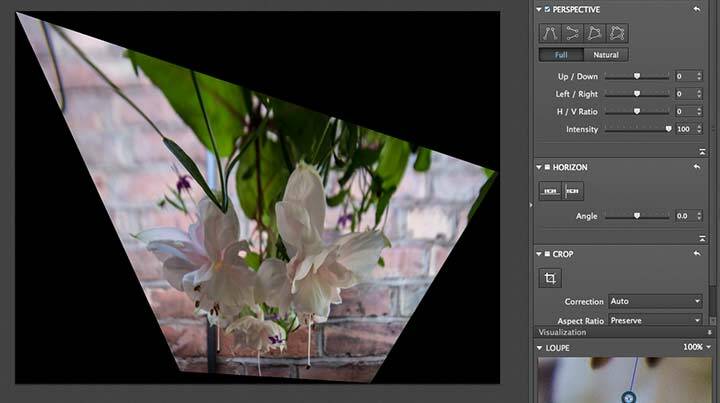 Many of the features are available in the DxO Optics Pro software package, but that’s not part of my everyday workflow, more something I use on specific images where I want a certain look, or make use of its extremely good noise reduction. There is a free demo of the software available which gives a time limited, but fully functional version of the software. Disclosure: Keith sometimes tests pre-release software for DxO, but has no direct business relationship with the company. Some of his commercial photos are included on the DxO web site, for which he receives no payment. 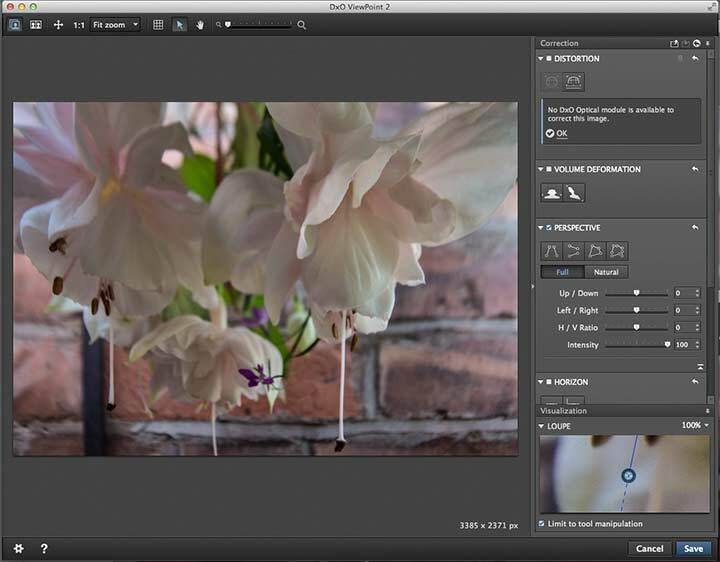 Easy to use with Aperture, Photoshop (inc. Elements), Lightroom, or as a standalone application. 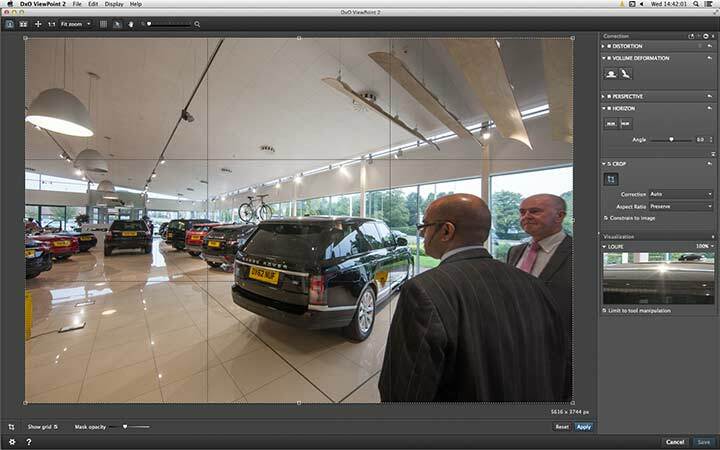 With the same license, DxO ViewPoint is available both as a standalone application for Mac and Windows and as a plugin. 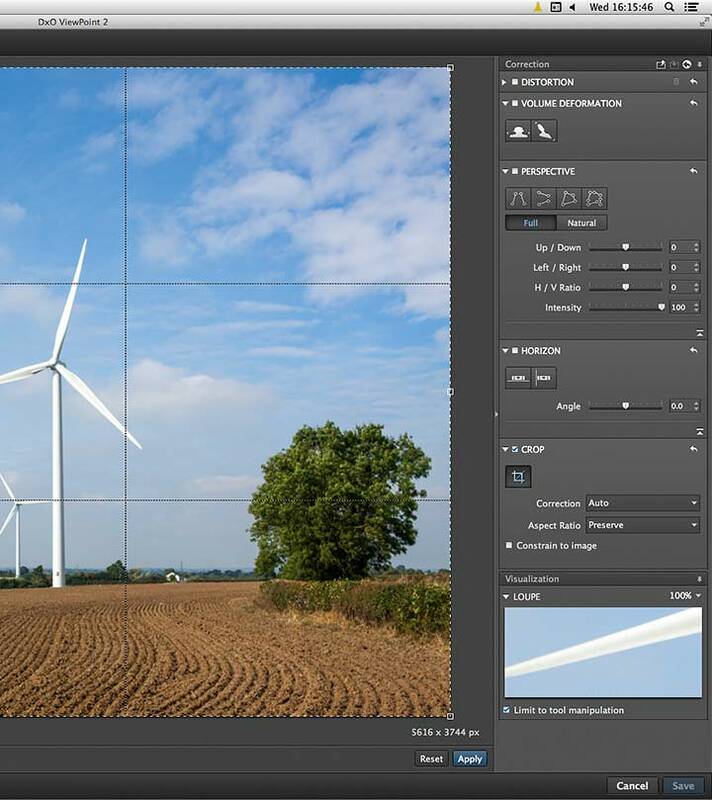 * Automatic distortion correction is not yet available for the Apple Aperture plugin.